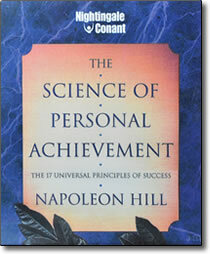 The Science of Personal Achievement CDs by Napoleon Hill – Discount! You’ve probably experienced fewer failures in life than these famous achievers. Each faced repeated setbacks. Yet each became enormously successful. How? Napoleon Hill devoted his life to studying this question, analyzing the success of more than 500 of the 20th Century’s greatest achievers. His exhaustive research proved that the essence of success lies within 17 simple principles that, when used together, serve as an infallible formula for achievement. These 17 key principles are the foundation of The Science of Personal Achievement, a comprehensive course in success that empowers you to convert any adversity into advantage. AND IT ALL STARTS WITH A THOUGHT. Welcome to your breakthrough to an extraordinary and fulfilling life! Consistently attain your goals as you incorporate the 17 principles at the heart of this course into your daily life. Become the architect of your destiny, capable of building a lifetime of accomplishment. Whether you are striving for success in your career or in your personal life, Napoleon Hill’s unique, universal philosophies will lead you directly to the source of all life’s riches.